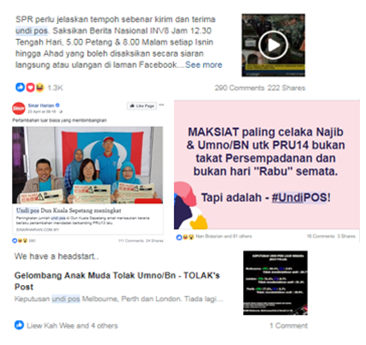 Home Social Media Social media's role in GE14: Can your news feed be trusted? 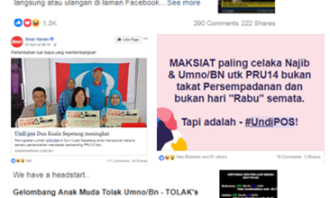 Social media's role in GE14: Can your news feed be trusted? Studies have shown that Malaysians are relying heavily on social media as their main source of news. Content being consumed through the social media feed plays a pivotal part in shaping a voter’s perception of the upcoming GE14. However, is a pro-government voter seeing the same organic content on their feed as a pro-opposition voter? The effects of echo chambers on social media were widely discussed after the great shock of Hillary Clinton’s loss in the 2016 US elections. American citizens were left reeling, wondering how Donald Trump could have possibly won the election when “all the signs” were pointing towards a comfortable win for Hillary Clinton. Fingers were then pointed at Facebook for creating a polarised environment through confirmation bias. The steady stream of content that reinforces the reader’s pre-existing beliefs and all the issues that come along with it has partially been addressed with the recent changes to Facebook’s news feed algorithm in 2018, that emphasizes content that is posted by friends, families, and groups over content from businesses, brands, and media. However, to demonstrate the still-existing effects of this echo chamber, consider the following topic of postal voters. 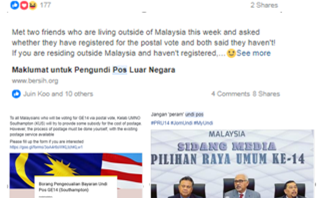 Parti Keadilan Rakyat vice-president, Nurul Izzah Anwar recently urged the Election Commission to reveal the exact number of postal voters in each parliamentary seat across the country to avoid any surprise results. 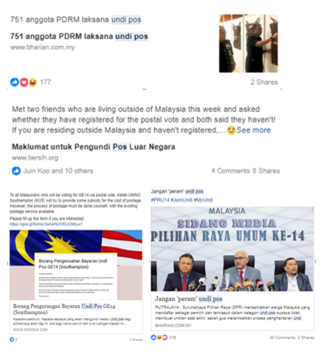 The feed of a pro-opposition voter would be rife with mentions that highlight how postal votes are a means for the government to win marginal seats illegally, and complaints about how postal votes do not exist for voters who are working within Malaysia but across the South China Sea from their voting constituents. In contrasting fashion, the feed of a pro-government voter is filled with a more positive message, urging early registration and sending of postal votes or postings ridiculing the paranoia of opposition candidates on the matter. As voters start engaging on content representing their political ideologies and interact on groups and pages that are in line, the danger of turning a blind eye towards an alternative or contrasting viewpoint sets in. Interestingly enough, until real world results prove otherwise, voters seem perfectly fine in consuming content that reside within their own sphere of understanding and beliefs. The regular individual would find it extremely difficult to get an objective overview on any topic over social media when content is being fed organically based on their circle of influence as well as their preferences. However, the strength of social listening tools is in the ability to objectively pick out content based on predefined keywords or topics of interest. At the time of writing, content on postal votes are skewed towards the negative as opposition key leaders stoke up the issue while the government coalition has been largely mum about the matter. 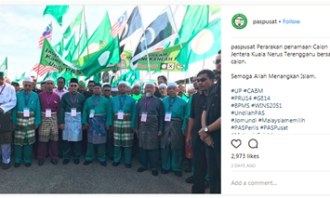 Social listening could also reveal some rather interesting findings, for example in the week following the nomination day, Parti Islam Se-Malaysia (PAS) gained traction on Instagram through its active postings in support of its individual candidates. 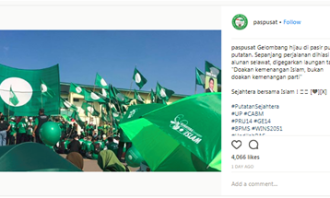 With content from the government and opposition coalition mostly being pushed via Facebook, PAS chose its battleground carefully and showed that they were very much also in the social media game with good understanding of its grassroot movements that are active on Instagram. Without proper social listening, one might be blinded to the fact the upcoming GE14 is very much a three-way fight instead of merely a battle between the Barisan Nasional and Pakatan Harapan. How can marketers learn from the social media war for GE14? Content on social media is insular and this might not change for the near foreseeable future. Marketers would do well to understand how different their target consumer’s social media feed appear, and always personalise content to address the different needs and desires. This can only be done when a marketer has an overarching, unbiased view on social media as to what their consumers are talking about and what they are interacting on. Without this knowledge, creating talk-able or share-ablecontent would prove particularly strenuous. There’s a tool for everything: Gather information via social media listening tools. Never search for social media information via individual accounts. Preferences and profiles built around individual accounts creates a silo of information that can only provide incremental insight if any at all. Hence, decisions should not be made based on a marketer’s own biased individual searches. Make readers go “Yes, exactly my point!”: Understanding the personas would help marketers craft differentiated, individualized content that is relevant and more likely to appear on the target’s social media feed.Use the right tone of voice that speaks to your target and use confirmation bias to your advantage by agreeing with your audience or disagreeing with an opposing view. Win Uncontested: Avoid being just another voice among the crowd by utilising the right social media channels at the right time. Sometimes, for first movers, there might not even be a battle to be fought. The writer is Eu Jeen Seah, lead researcher, Zanroo.